While Measure DD projects have resulted in a revitalized tidal lagoon, advocates of the lake say water quality and monitoring could still be better. Experts say there are several changes the city could make to improve the lake’s oxygen levels. First, there was the river otter. Then, there was the bat ray. Anecdotally, it seemed as if the sightings of such creatures at Lake Merritt in the last nine months have been signs of positive improvements for the tidal lagoon, largely as a result of work funded by Measure DD, the $198.25 million bond measure that Oakland voters passed in 2002, mainly to improve the waterfront at Lake Merritt and the Oakland estuary. One of the most significant projects so far has been the removal of the culvert at 12th Street, which improved the water flow between the estuary and the tidal lagoon. But activists and supporters who closely monitor Lake Merritt say the 12th Street project, which cost $35 million and was completed last June, hasn't yet improved the water quality at the tidal lagoon as much as they expected. One of the biggest indicators of water quality is the dissolved oxygen level — i.e., the amount of oxygen in its dissolved form. A low dissolved oxygen level essentially inhibits the ability of aquatic animals to breathe and is thus a major obstacle to improving biodiversity. There are many factors that contribute to oxygen levels in Lake Merritt, but some of the biggest ones are runoff and tidal flow. Katie Noonan, who is the co-director of the Environmental Science Academy at Oakland High School, has been regularly taking her students to Lake Merritt to test water quality since 1997. Typically, said Noonan, dissolved oxygen levels at the tidal lagoon go below the EPA's minimum standard of 5 ppm (parts per million) during the winter and spring, when more freshwater comes into the lake. That's because "a cap of freshwater forms over the salt water, and that prevents oxygen from the atmosphere from coming into the lake," said Noonan. In February, March, and April, Noonan and her students took readings of below 5 ppm. Levels were particularly low at the bottom of the lake. "It was somewhat of a surprise for us — we've been seeing low oxygen in the area of the channel which has been widened," said Noonan. She added, however, that her students' method of obtaining data — a simple colorimetric test that is cheap and easy to use — may not be entirely accurate. So in May she borrowed a more sensitive meter from the EPA and found that her students' method was reading slightly low. But the higher oxygen reading (between 5 and 10 ppm) could have been due to increased sunshine and wind and higher tidal flows, said Noonan. To confirm that the higher EPA-instrument reading is an accurate reflection of overall increased oxygen levels in the lake — and not the result of those particular circumstances — Noonan plans to use the more sensitive instrument to do another reading in July — in the early morning, when oxygen levels are at their lowest. While the opening of the 12th Street culvert has vastly improved Lake Merritt's tidal range — which is to say, high tides are now higher and low tides are lower — "in terms of dissolved oxygen we have not seen a big difference," said Noonan. Part of the problem in understanding Lake Merritt's actual water quality is that, until relatively recently, few people have been paying attention. "The thing is, nobody professionally monitors Lake Merritt," said Noonan. "We're the only people who do it consistently." City officials only discovered that there was an oxygen problem in Lake Merritt about a decade ago, said Lesley Estes, Oakland's watershed manager and overseer of Measure DD projects. The city finally tested oxygen levels (in three separate locations) during construction of the 12th Street project, and found that they ranged between 5 and 20 ppm. The vast discrepancy was due to the opening and closing of the tidal gate. Most residents don't know that a large pump station exists below ground on 7th Street. 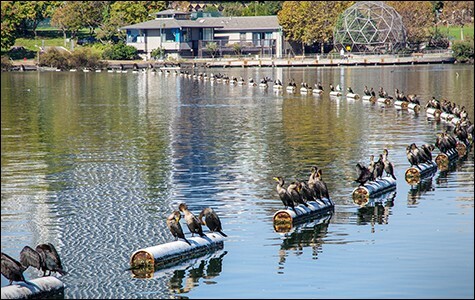 The Alameda County Flood Control & Water Conservation District operates it, and its main purpose is to prevent Lake Merritt from flooding — a not-uncommon occurrence back in the 1940s, '50s, and '60s. Constructed in 1971, the pump station controls the opening and closing of the tidal gates, as well as allows water to be forcibly pumped out of the tidal lagoon during high tide. The subject of when the tidal gates should be opened and closed has been a major issue for Lake Merritt advocates. That's because closing the gates cuts off tidal flow from the estuary, resulting in lower oxygen levels in Lake Merritt. 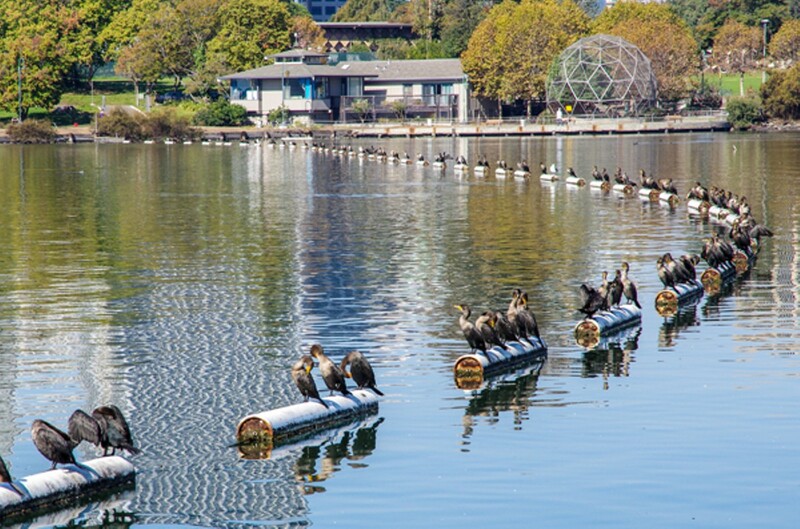 "If they close the gates and the lake stratifies — forms two layers — the bottom layer becomes a dead zone," said Richard Bailey of the nonprofit Lake Merritt Institute. Whenever there's a 50 percent chance of rain in the forecast, the tidal gates are closed, in order to prevent flooding. But the downside of being so cautious, Bailey continued, is that "when you keep the high tide out, it gets rid of the flushing." Bailey said there are several changes the city could make to improve Lake Merritt's oxygen levels. One would be the purchase of a 24-hour oxygen recorder, which costs a "couple thousand bucks." That way a continuous recording of oxygen levels would be available for everyone to see. (Estes said the city doesn't do anything with the data Noonan's class collects because of its unreliability, although it was shared with the city's consultants.) In addition, the tidal gates have to be operated manually — meaning someone has to physically go to the pump station to set the computer that opens and closes the gates (although they can be monitored remotely). Having the ability to open and close the tidal gates remotely would not only fine-tune the process but also save resources, said Bailey. The main purpose of the pump station is to control flooding, and "right now they err on the conservative side," Bailey added. "We've been arguing about this forever. They used to close the gates for the weekend." Since 1981, Gene Mazza has been the pump station supervisor for the Alameda County Flood Control & Water Conservation District. During a recent tour of the Lake Merritt Flood Control Pump Station — one of 24 pump stations he oversees — Mazza said he performs a "balancing act" between controlling water quality and flooding. "I try to make everyone happy," he said. Mazza also defended the county's flood control practices, saying that while "a one-inch rainstorm by itself won't flood the lake, a one-inch rainstorm with a six-and-a-half-inch high tide would." "I was hired specifically to not let that happen," he said. The last flooding at Lake Merritt happened in the late Nineties, during a "100-year storm event," he said, and that was mainly because water couldn't drain into the bay fast enough. He also estimated that in a 365-day period, the tidal gates are open 90 percent of the time. During the period from October to April, they might be closed 10 to 15 percent of the time. Besides closing the tidal gates during rain, the county also closes them during special circumstances — for example, during construction of the 12th Street project or when there's a boating event or maintenance work. Until about six months ago, the process of requesting the tidal gates to be closed was somewhat haphazard, with requests going directly to Mazza. Now, Estes said, those requests have to go through her. For example, the county recently got a request from someone who wanted to put boats in the water at high tide — which happened to be at 6 a.m. — to close the tidal gates until 10 a.m., to make the process easier. Estes denied the request: "We said, 'no, that's not an appropriate request.'" Estes agrees that having a more automated system would be beneficial to improving water quality. "As we do these projects and we really monitor the tides and understand tidal flushing, we're going to work with the county to standardize gate closures," she said, adding that she hopes to install some sort of automated gate system. "We want to be able to operate it remotely so they're not closed for three or four days." Estes acknowledged that she and her team may not be able to bring Lake Merritt's oxygen content up to a level activists like. "Tidal lagoons in the first place are very difficult environments," she said. "It's just the nature of the tidal lagoon. It's always going to have oxygen challenges." However, the city has been making improvements to storm drains to reduce to the flow of garbage flowing to the lake. Several years ago, it also conducted a public education program to reduce fertilizer use. "We have an active yard trimming program that we didn't have back then," Estes added, explaining that much of that debris used to end up in the lake. In the meantime, the full impact of Measure DD is yet to be realized. The project is only at the end of its second bond phase (there are three), and many more changes are to come, including the construction of a small boat passage at 7th Street. Construction is currently underway to remove the culvert at 10th Street, which will further improve tidal flows. The city plans to test oxygen levels in the lake again once that project is finished, sometime in 2015, said Estes. While much of the Measure DD projects so far have been to beautify Lake Merritt, there are many other components that are less obvious. "There's this whole other effort that's unseen that we feel has had a significant impact on the lake," said Estes. "The reduction in trash, we haven't measured it, but people see it and say, 'Wow, this is a different lake.'"